The Maya populations of Guatemala are distinguished through the richness of their textile arts. 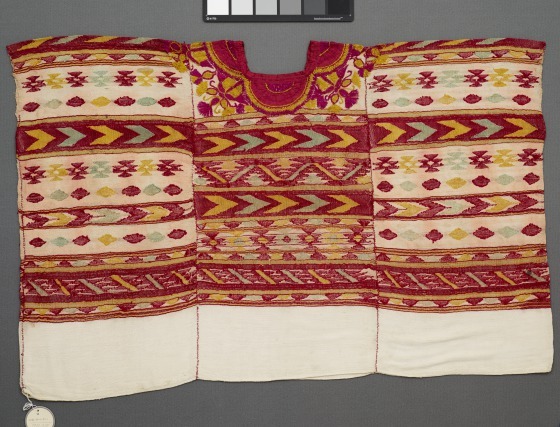 One of the most distinctive and recognizable garments is the huipil, a tunic-like blouse worn by Maya women. Woven on a backstrap loom, the huipil is often composed of three panels sewn together. The brocaded designs that decorate the surface consist of specific colors, patterns, and figures that signify the community identity of the weaver. This huipil pertains to the municipality of Sacapulas in the modern-day department of Quiche in Guatemala. 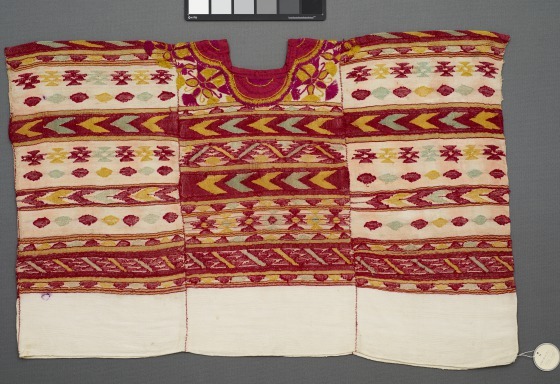 The textile is nearly identical to another example from Sacapulas in the Museum's collection [1983.365], with subtle contrasts of pink and red throughout a rhythmic pattern of diamonds and chevrons. The four-scalloped appliqué designs around the neck add visual weight to the otherwise supple fabric of these ornate historical huipiles from the Maya community of Sacapulas. Kimberly L. Jones, Label text, 2017, A. H. Meadows Galleries. Learn more about the significance of huipiles.